Wilfredo C. Lara, MD, a board-certified ophthalmologist, is fellowship trained in disease and surgery of the retina and vitreous. He was born in Maryland and raised in Miami, Fla. He obtained his undergraduate degree from Florida International University with extensive academic and personal accomplishments. 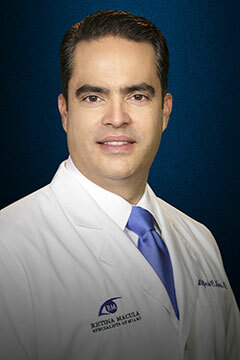 Dr. Lara is deeply embedded in the South Florida Community and is fluent in Spanish. He obtained his Doctor of Medicine degree from the University of Virginia School of Medicine where he received numerous awards. He then completed an internship at the Hospital of Saint Raphael/Yale School of Medicine. Dr. Lara went on to complete an ophthalmology residency as well as a two-year fellowship in vitreoretinal surgery at the University of Florida, Gainesville. Dr. Lara, together with Drs. Gonzalez, Levy, Shienbaum, and Taher, established Retina Macula Specialists of Miami with the vision of improving quality of life through prevention and treatment of retina and vitreous disease. Retina Macula Specialists of Miami is committed to providing personalized care while delivering the latest technological advances in the field.